Learn English. Create your future. At meetings and events, we need a good level of business English to listen to or make presentations and take part in discussions. You may also need to speak to colleagues or clients in the breaks before and after the official talks. 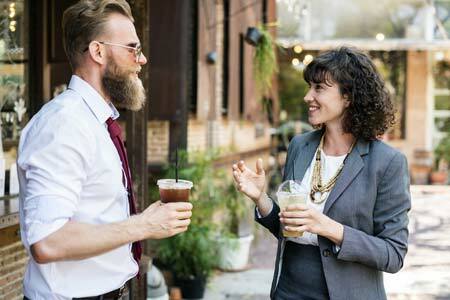 This usually involves small talk and here are some ideas to make it more natural. We provide prompt cards for eight different topics to help you with small talk conversations in English at business events or at work. 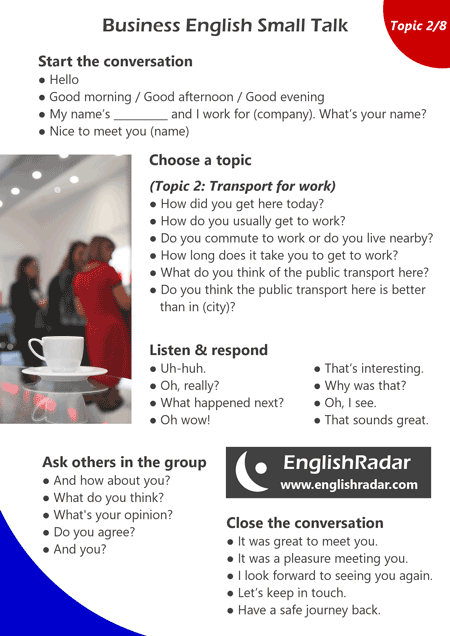 You can also use these cards to practise speaking English with colleagues or an take an English course with an English trainer in Munich (or online) to prepare for your next business event. Try to remember a few business English small talk expressions and questions for each stage. Then you can use these for future business events, but try to mix it up if you always meet the same people! It is always safe to ask questions about where you work and for how long you have been at a company. You can also ask about how people get to work and make comparisons with your own experiences. It is also possible to find out more information about someone's position. We can all talk about the weather! You can also ask questions about what others do in their free time and find things you have in common. Asking about and sharing holiday experiences can be a great way to break the ice. You might have drinks and snacks before and after meetings, so you can find out more about preferences. At business events, you often meet people from the same industry and can compare notes on education experiences. Take our online English test today!